Whenever I cook chilli con carne, I tend to do it on the hob, using a packet mix. I thought it’s high time I cooked it completely from scratch, and did so for my Halloween family get together at the weekend. I also used the slow cooker to prepare it low and slow and I have to say, I was rather pleased with the end result! I started by cooking off onions, garlic and bell pepper (I used small ones and a mixture of colours) in a pan, before browning off the mince and adding spices. That then got transferred to the slow cooker with 3 kinds of beans, tinned tomatoes, beef stock and pumpkin. I cooked it on low for about 7 hours, and the flavour was so good! Another winner with my crowd! Switch your slow cooker onto high. Add the oil to a large pan and gently fry the onions, garlic and bell pepper for a few minutes. Stir in the tomato purée, salt and the herbs and spices. Pour this mixture into the slow cooker and add the beans, chopped tomatoes, fresh pumpkin and beef stock. Turn your slow cooker down to low and cook for 7 – 8 hours. Serve with your choice of rice or tortilla chips and topped with any of the suggested toppings. This recipe is definitely a keeper for me! I loved that apart from “work” of browning off the mince, I could just throw it all into the slow cooker and forget about it all day long. 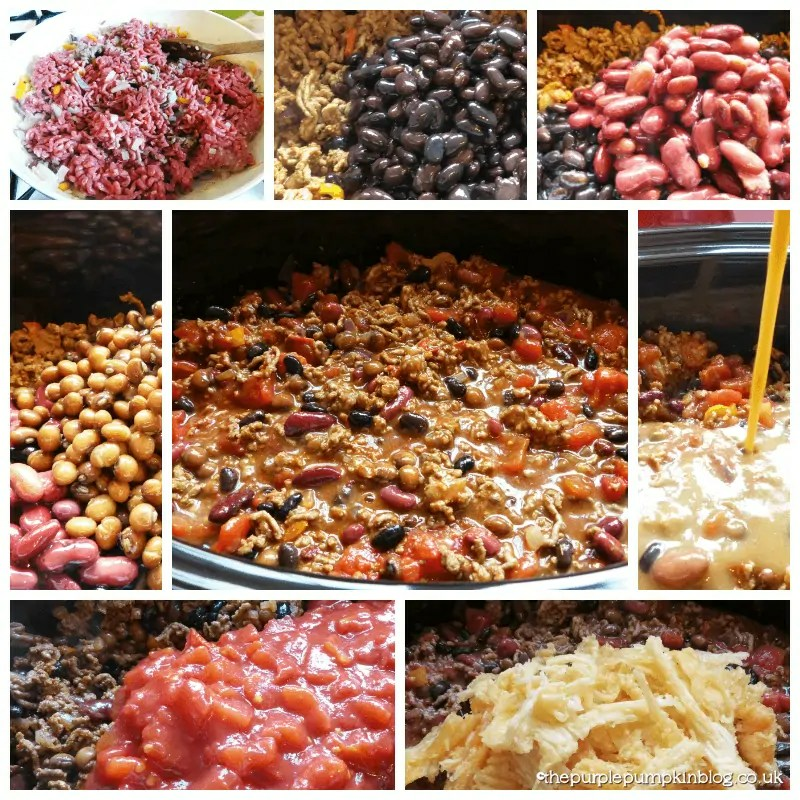 I used the particular beans in this recipe as there was a special offer in the supermarket for 3 for the price of 2, so that’s what I picked up – use any combo of beans you like! Yum I really want to make this – looks great! sounds lush, I grow my own pumpkin so always looking for things to cook with it. saving this one to try. 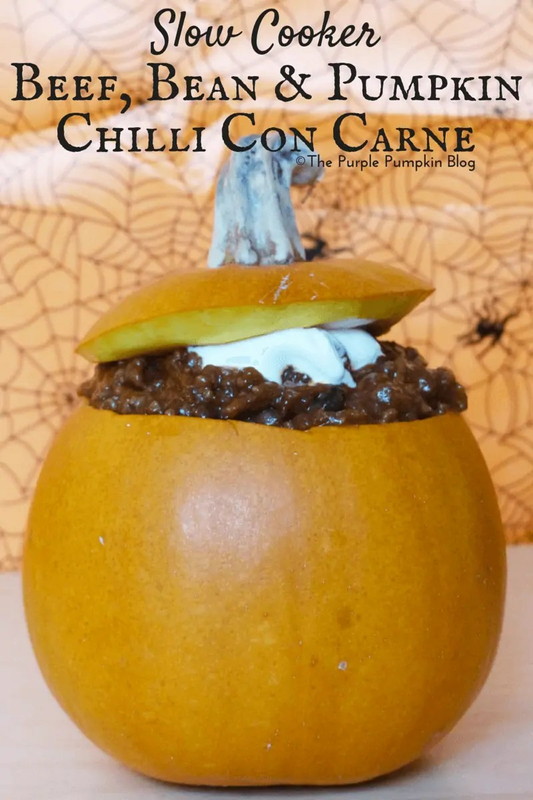 Looks so delicious, and love the novel idea of serving in a pumpkin – ideal for Halloween! this looks great – really inventive! Love this recipe- makes my mouth water… so hungry……. This looks delicious. Great for Halloween. oh, I am such a sucker for chili! Probably one of the main things I cook during autumn and winter. Lovely recipe, will be trying this one! Have already ‘pinned’ it!